Second and third look laparoscopy in pT4 colon cancer patients for early detection of peritoneal metastases; a randomized multicentre trial. Approximately 20-30% of patients with pT4 colon cancer develop peritoneal metastases (PM). Due to restricted accuracy of imaging modalities and absence of early symptoms, PM are often detected at a stage in which only a quarter of patients are eligible for curative treatment. New diagnostic strategies are urgently required to detect PM at an early stage, when the disease is still potentially curable. Preliminary findings of the COLOPEC trial (NCT02231086) revealed that PM were already detected during surgical re-exploration right prior to intentionally adjuvant hyperthermic intraperitoneal chemotherapy within two months after primary resection in 10% of patients with pT4 colon cancer. Based on these findings and literature, second look diagnostic laparoscopy (DLS) to detect PM in a subclinical stage may be considered as an essential component of early follow-up of these patients. This needs confirmation in a larger patient cohort before implementing this in practice. However, some patients develop metachronous PM at a longer interval (>12 months) from primary resection. These patients will be missed by a second look DLS and might therefore benefit from a third look DLS later on. The primary aim of this study is to determine the added value of a third look DLS after a negative second look DLS in pT4N0-2M0 colon cancer patients to detect PM at a subclinical stage. Secondary aims are to determine the incidence of PM during second look DLS, proportion of detected PM eligible for curative intent CRS+HIPEC during second and third look DLS, incidence of PM in patients who did or did not undergo adjuvant chemotherapy, sensitivity of CT imaging to detect PM compared to DLS, incidence of clinically detected PM occurring in between/after DLS, sequence of developing peritoneal and other distant metastases, DLS-related morbidity, need for adhesiolysis in relation to detection of PM and adhesion related morbidity, 5-year peritoneal recurrence free, disease-free and overall survival and quality of life. 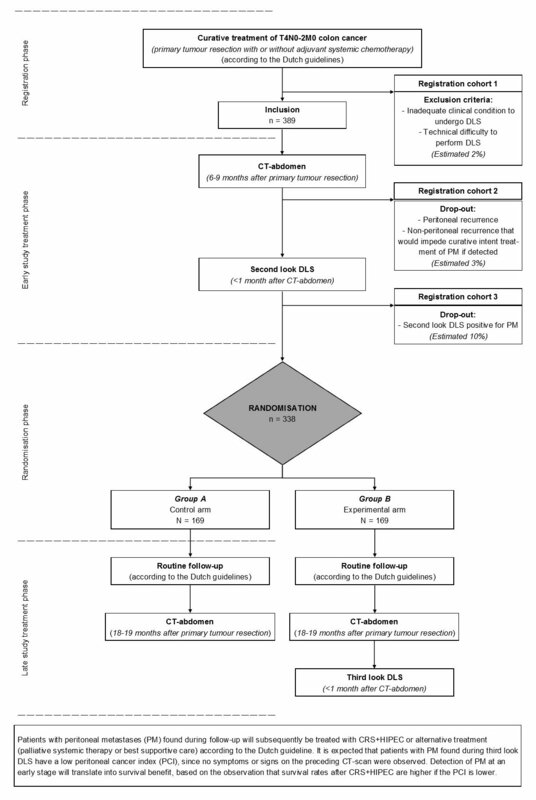 This is a randomized multicentre trial in which eligible patients will undergo an abdominal CT at 6 months postoperative (+3 months for those still treated with adjuvant chemotherapy), followed by a second look DLS within 1 month if no PM or other metastases not amenable for local treatment are detected. Patients without PM during second look DLS will subsequently be randomized between routine follow-up including abdominal CT at 18 months in the control arm, or an experimental arm with a third look DLS provided that PM or incurable metastases are absent at the 18 months abdominal CT. Patients aged 18-80 years who underwent intentionally curative resection of pT4a,bN0-2M0 colon cancer or rectosigmoid cancer above the peritoneal reflection, either with or without adjuvant systemic chemotherapy, who are fit enough and surgically accessible to undergo second look DLS between 6-10 months postoperatively. The primary endpoint of the study is the proportion of PM detected after negative second look DLS. The primary endpoint will be determined at 20 months. It is hypothesized that in patients who had a negative second look DLS, PM become clinically apparent in 5% until 20 months postoperatively with routine follow-up. A third look DLS following a negative CT-abdomen at 18 months postoperative is expected to detect an additional 10% of PM. It is expected that detection of PM at a clinically occult stage will translate into survival benefit, based on the observation that survival rates after curative intent treatment are higher if the extent of peritoneal disease is more limited. Follow-up after curatively resected pT4 colon cancer, consisting of second look DLS after negative CT abdomen at 6-9 months and normal CEA, with subsequent routine follow-up according to the Dutch colorectal cancer guideline until 5 years. Follow-up after curatively resected pT4 colon cancer, consisting of second look DLS after negative CT abdomen at 6-9 months and normal CEA, with subsequent routine follow-up and third look DLS after negative CT abdomen at 18 months and normal CEA. Third look DLS is not performed in patients with evidence of disease that is not curable, or in those already diagnosed with PM in the preceding period.